The weather here has just started to turn crisp, and I’m mourning the end of the summer. We had so much fun during those hot hazy days, adventures and trips and toes in the sea. One of our most favourite weeks was a trip to Turkey with Mark Warner. A couple of years ago we were chosen to be Mark Warner Ambassadors and test out some of their holidays. We loved them so much, they kindly offered us a discount on a trip with them this year. 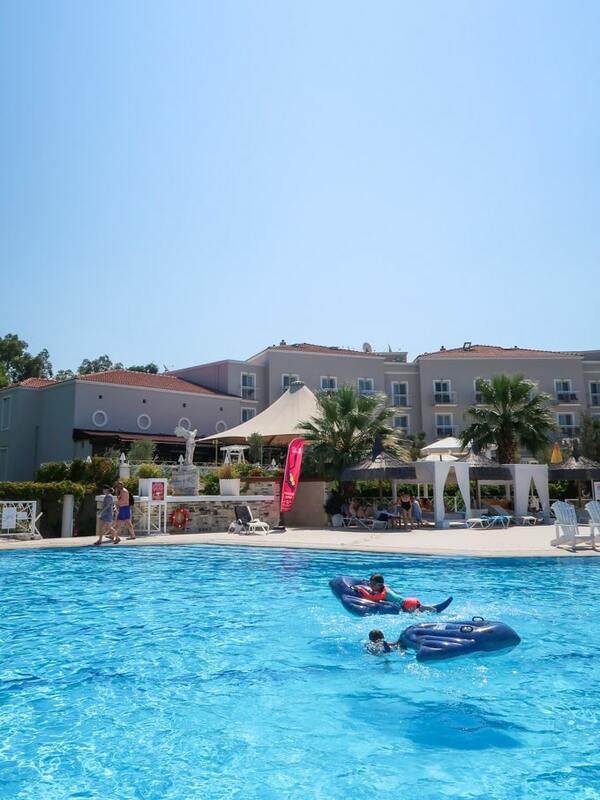 We decided to test out their newest resort – Phokaia in Turkey. We’d never been to Turkey before, and having enjoyed out previous Mark Warner holidays so much before, I was really curious about what we’d find there. You’d never know that this resort is so new to their portfolio as the service is as good as at any of their resorts. Super friendly and attentive, there was always staff on hand to help. The resort itself is quite large, but it never feels busy and there’s a real feeling of luxury. The super friendly staff made us feel at home from the moment we arrived. Nothing was too much trouble, from the welcoming party on our arrival, to arranging trips into the small nearby town and finding our lost property! There’s one main large outdoor pool, with a small, shallow kids pool next to it. The pools are spacious, clean and really well equipped. We loved the gorgeous shaded day beds by the pool. There’s a bar overlooking the pool as well as a large bar on the beach, where we enjoyed happy hour drinks most evenings, watching the sunset. We had interconnecting rooms in the main hotel building, which worked really well for us. Although there are also villas in the beautiful grounds, which I’d love to try on another visit. As always with Mark Warner, there’s no pressure to do any of the amazing list of activities on offer, but they are all there ready and waiting, with loads of help at hand if you fancy. 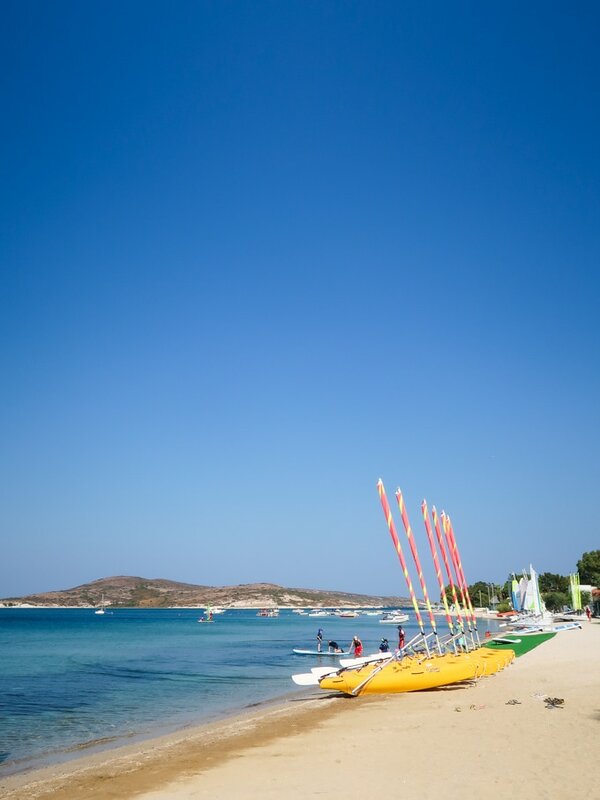 There’s free intro sailing sessions, evening social tennis, a full aerobics schedule, not to mention morning runs, windsurfing, and paddle boarding. There’s so many opportunities to try something new, and the staff are so friendly and welcoming in encouraging you to do so. There’s also waterskiing available at Phokaia, which is a greta addition as it hasn’t been offered at any other Mark Warner resort we’ve visited (and you get a free trial session). Do spa visits count as an activity?! The spa and Turkish Bath are absolutely gorgeous and we had some amazing treatments there. I’d definitely recommend it if you’re visiting. It’s quite an experience! There is one main restaurant at Phokaia, overlooking the pool area. Don’t be put off by there being one restaurant – it is absolutely fantastic. As a super foodie myself, I was so impressed. I’ve rarely known a hotel buffet service that’s so impressive. Each morning, lunchtime and evening there were a huge variety of options, including local dishes, dishes made in front of you and child friendly options. Two nights a week, there isn’t an evening meal service. On one of those evenings we visited the local town which was super simple to arrange and a really fun adventure – I’d definitely recommend a visit. On the other non restaurant night, the hotel organise a big barbecue at the bar by the beach. 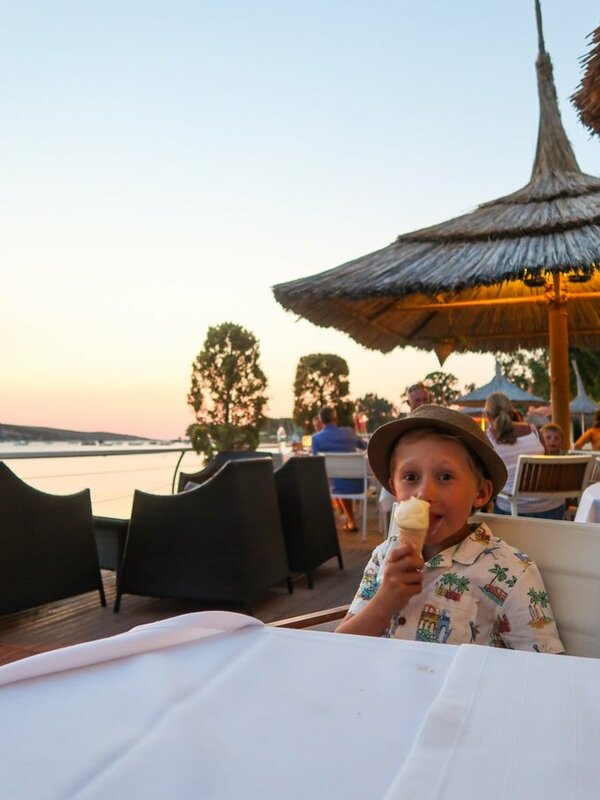 You book and pay for this locally – it was so much fun, watching the sun go down as we ate delicious food with music and a brilliant atmosphere. This was the first year that G&H could go to kids club almost all day if they wanted, with sessions morning and evening. 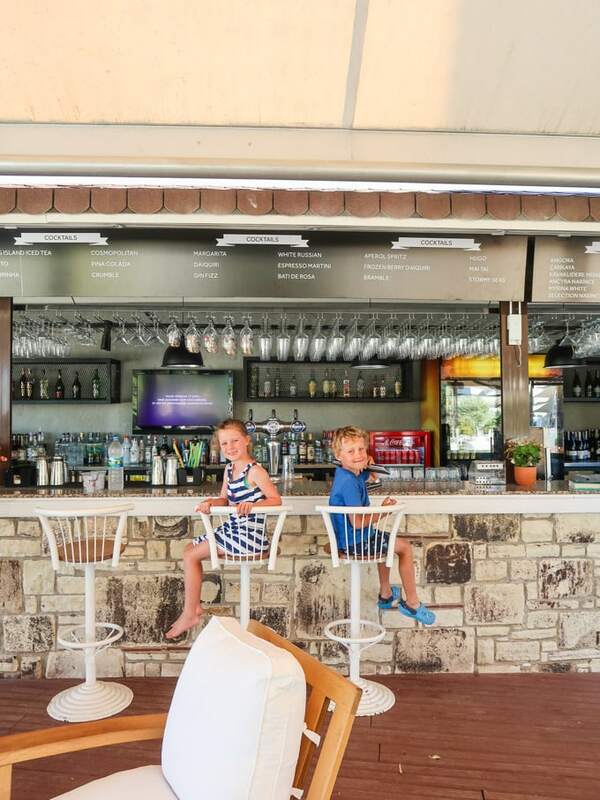 I also noticed that as they are now older, they spent much more time outside at this resort that they have done before – which I think is great. During their sessions they tried sailing and windsurfing and spent lots of time in the pool, splashing their nannies with glee. As always, the Mark Warner nannies were helpful, accommodating and full of energy. They absolutely LOVED their sessions, and whilst I tried to persuade them to come out and play with us, they didn’t want to miss anything! The other Mark Warner service that was brilliant again this year, was the evening movie club. In the evening, you take your littles, ready for bed, to the Mini Club room and they can watch a movie with their new friends. Then, when they are ready, they hop into their cosy sleeping bag in their own little bed for the week. You pick them up, happily snoozing at 10:30 and carry them back to your room. George and Harriet actually should have been in the older group for these evening sessions, but they wanted to go to the younger one to watch the movies and they were made really welcome. This is such a great way for them to enjoy the evening with their little pals in a restful way, and also to be able to enjoy an adult dinner. 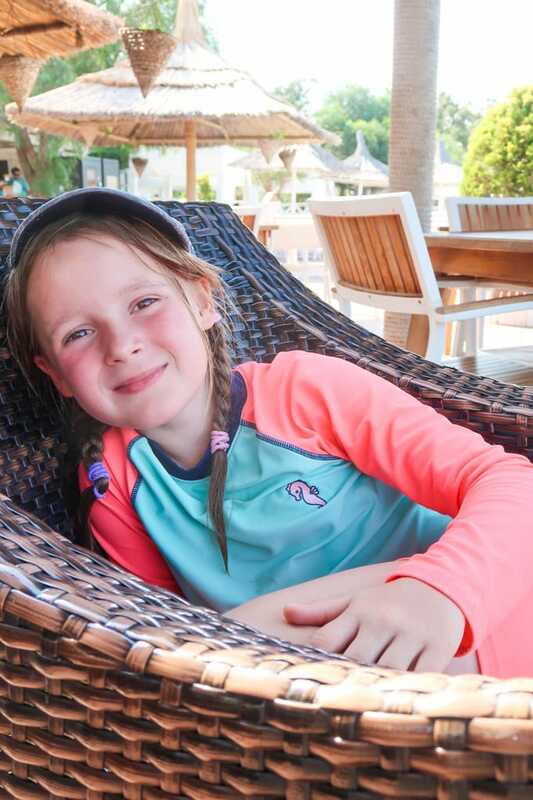 All of the things that make Mark Warner holiday great are there in bucket loads; watersports with brilliant safety, British nanny run kids clubs included, fantastic staff, evening children’s ‘movie club’ and high tea for the little ones. Here are some of the other bits we loved about this particular Mark Warner resort.. The food is faultless, really fresh and delicious with great variety. The bay is an absolutely beautiful spot. Watching the sun go down there is magical. The hotel feels very clean, luxurious, stylish and well equipped. The pool and comfortable lounges and beds poolside are just gorgeous! The nearby town of Foca is easily accessible for a taste of real Turkey. It is quite a long transfer time from the airport to resort at 1 hour 45 minutes. This certainly wouldn’t put us off visiting again, but just something to prepare for if travelling with you children. 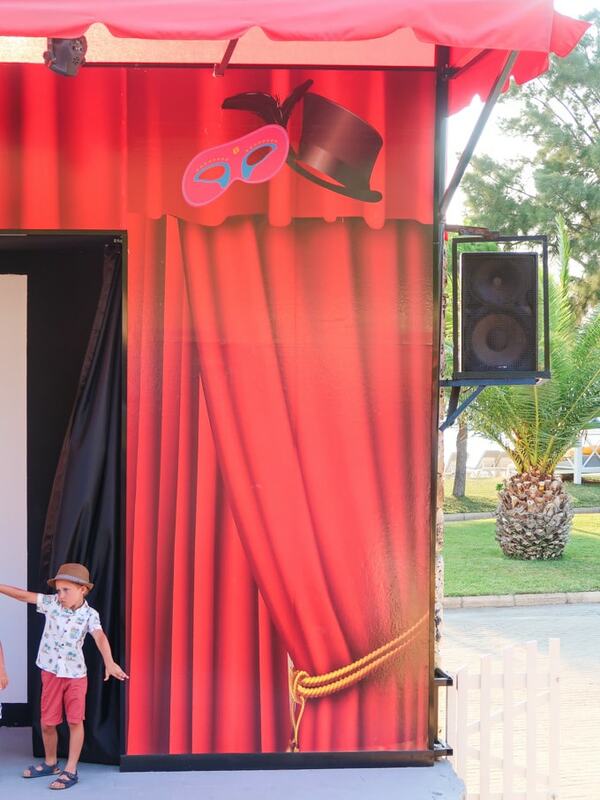 We were so impressed by Phokaia Resort in Turkey. It’s certainly my new favourite Mark Warner resort. Incredibly welcoming, fantastic facilities, spotlessly clean and well equipped with amazing food. Thanks again Mark Warner, we will be back! Holidays with Mark Warner to Phokaia, Turkey start on 11th May 2019 from £599pp for 7 nights. Disclosure: We were given a discount on our Mark Warner holiday in return for an honest review. As always, all opinions are truthful and I wouldn’t endorse a product I didn’t genuinely think was excellent.